With the holidays right around the corner it is time to start thinking about what gifts you are going to be getting for your loved ones. If you are visiting this site it is safe to assume that you or another person close to you is a fan of the sport of basketball. Given this a great gift for basketball fans and players alike is an arcade basketball game. They offer interactive gameplay with family and friends and can even help you develop your skills. While these arcade basketball games are not cheap, they are fairly reasonably priced for what you get. They generally range in price from $100 to over $250. We find this to be quite affordable when you consider what you are getting for the money. Another factor to consider when deciding to buy an arcade basketball game is the size of the unit and the space in your house. These things are not small and will take up a lot of room. So, for those living in a small space we recommend not buying an arcade basketball game. For the rest of you we have selected four arcade basketball systems that are the best available. 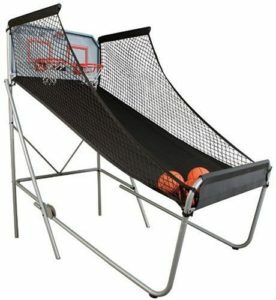 Click on the “See Amazon Price” button for each to see the basketball system’s Amazon product page. First up on our list on our best arcade basketball game is the Shaq Cyber Hoop Shot. 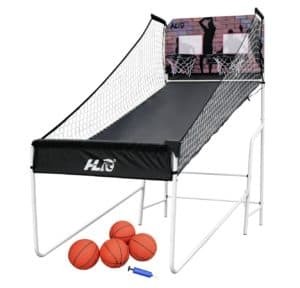 This basketball arcade game has changed the game of recreational basketball entertainment by allowing you to compete against others with this arcade hoop from around the globe. This is done by way of Bluetooth and your smartphone or tablet. 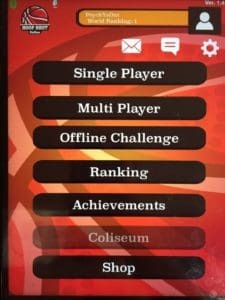 The folks behind Shaq Cyber Hoop Shot have brilliantly created an app that goes with the arcade and allows you to connect to the scoreboard. Not only can you play against others virtually, but you can also compete against yourself through the single player games that are available on the app. This includes the standard “Arcade” mode, where you try to score as many points as possible over four one minute quarters. There is also “Single Ball” mode where you make as many shots as you can in a row. Finally, you have “Training” mode where you can compete against the computer for a minute period. We also love the ranking and achievements features that show you how you compare to other players and also allow you to see your progress over time. The arcade itself is also of good quality. There are two hoops and a scoreboard with LED display. The only weakness is the plastic, spring-loaded scoring sensors. We prefer to see these arcade basketball games with infrared scoring sensors that are less likely to give false-positives and false-negatives. Overall, this is a great, and innovative arcade basketball system that takes basketball entertainment to a new virtual level. Our second pick comes from Lifetime, which is a leading manufacturer in Made in the USA portable basketball systems. Most of the hoops that Lifetime produces are affordable but have a good quality for the money. Thankfully, the Double-Shot Arcade is in the same category. While you don’t get the interconnectivity of the Shaq Cyber Hoop Shot, which is a big drawback, the Double-Shot does have some important pros. 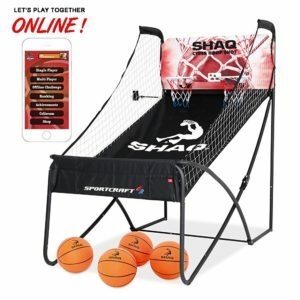 Most of all is that this basketball arcade utilizes infrared scoring sensors, which are more accurate than the plastic spring-loaded sensors found on the Shaq Cyber Hoop. You can be sure with the Double-Shot that each basket will get counted. There are different game modes you can play with the Double-Shot as well so you and your family will be able to have fun competing against each other. Lastly, the rims on the Double-Shot Arcade Basketball System are the best we’ve seen. 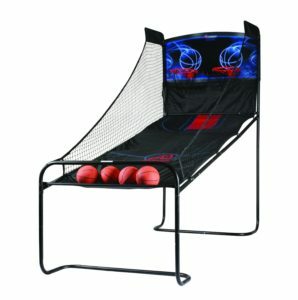 Very heavy-duty and sturdy, which is a big plus when it comes to the enjoyment of the game. If you don’t have the ability to play others virtually, then having as many game options as possible to play against friends and family is important to keep things fresh. The HLC Sports Arcade Basketball System has 8 distinct multi-player modes that allow you to compete against other in different ways. The two rims on this arcade are quality with 1.5″ steel frame construction. These I find to be your standard rims, not the best, but certainly not the lowest quality either. As for negatives, several users commented that the assembly for this arcade hoop is a real challenge due to directions that are unclear. This can make things frustrating before you even get to use your new arcade system. Overall, we found the Shaq Cyber Shot Hoop to be very clear in comparison to the HLC Sports Double Shot. The last selection is certainly not lacking when compared to other arcade basketball systems. The Atomic Deluxe Basketball Shootout comes from Escalade Sports, which may be a name you are unfamiliar with. However, some of their other brands will be familiar such as the Silverback and Goalrilla lines of premium quality in-ground basketball hoops. If you know anything about these brands, then you know Escalade is committed to quality. We love the looks of this arcade basketball game compared to the others on this list. It has sharp blue colors over a black background on the backboard, which just looks cool. From a quality and features standpoint, the Atomic Deluxe most resembles the Lifetime Double-Shot Basketball Arcade. Each have infrared scoring and are similar in size. With the Atomic Deluxe you get four mini-basketballs as well as an air pump so that you don’t have to miss any action if you get a flat basketball or two. However, at the end of the day we prefer the Lifetime Double-Shot to the Atomic Deluxe, because the former just does everything a bit better than the latter. With that in mind you can pick up the Atomic Deluxe for about $50 less than the Lifetime Double-Shot, so if you want to save a little bit the Atomic Deluxe could be the right choice for you.